The headquarters of Starwood Hotels and Resorts Worldwide are located in the South End section of Stamford, Conn.
STAMFORD — Marriott International plans to lay off 163 Stamford-based employees at the turn of the year, a move that would represent the first round of local downsizing following its September acquisition of Starwood Hotels and Resorts Worldwide. The layoffs mostly affect senior positions such as vice president, director and other managerial posts. The cuts would take place between Dec. 31 and Jan. 13, according to city and state records. Marriott completed in September its approximately $13 billion acquisition of Stamford-based Starwood, a union that created the largest hotel company in the world. But the absorption of Starwood into Marriott meant that Starwood’s home at One StarPoint in the city’s South End would no longer operate as a corporate headquarters because Marriott is based in Bethesda, Md. 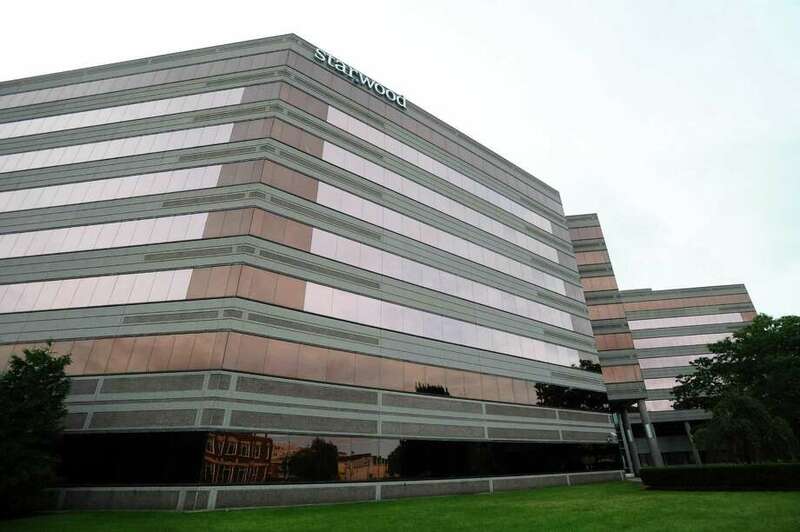 Many observers of the company had anticipated the merger would have a major impact on Starwood’s approximately 700 Stamford-based employees. A number of local business leaders have expressed concerns that the merger could lead to the firm’s eventual departure from the city. Marriott officials said that they expected to maintain a presence in Stamford for the foreseeable future. “When we announced the merger in November 2015, we said that there would be some duplication of functions — mostly at the corporate level,” McLemore said. “While we don’t have an exact number of jobs that will be impacted in Stamford at this time, we will know more about staffing decisions as we continue the integration process. Laid-off employees would be able to apply for other positions in the company, according to Marriott officials. “We also anticipate that many associates will find new opportunities within the company and we will be working closely with them through this process,” McLemore said. Madden and Mayor David Martin said that they did not think that Marriott’s cuts would disrupt the city’s economy. Corporate expansions in Stamford — such as the recently announced move of Henkel Corp.’s laundry and home care and beauty care headquarters from Arizona — far outweigh downsizing and departures, they said. Martin also cited Starwood for its backing of the Mayor’s Youth Employment Program, which supports hundreds of high school students, and its training events with The Business Council of Fairfield County. Starwood has been based in Stamford since 2012, when it moved from White Plains, N.Y. While they review their Stamford offices, Marriott executives are looking for a new headquarters in the Washington, D.C., area. About 4,000 Marriott employees are based in Bethesda and in satellite offices in the surrounding area. Marriott’s headquarters lease runs until 2022. The newly expanded Marriott now operates or franchises more than 5,700 properties and 1.1 million rooms, comprising 30 brands in more than 110 countries. With the completion of the Starwood acquisition, Marriott’s distribution expands to include Starwood’s portfolio of some 1,300 hotels worldwide. In comparison, Hilton Worldwide operates as the second-largest business in the industry with about 4,700 properties.